The workshop at The Bronze - Kelesis Yannis produces bronze statues and other items using methods ancient Minoans utilized to create their artwork. A visit to this shop is a chance to see artisans at work and learn something about smelting techniques. In addition, you can purchase unique souvenirs here, or place a special order. 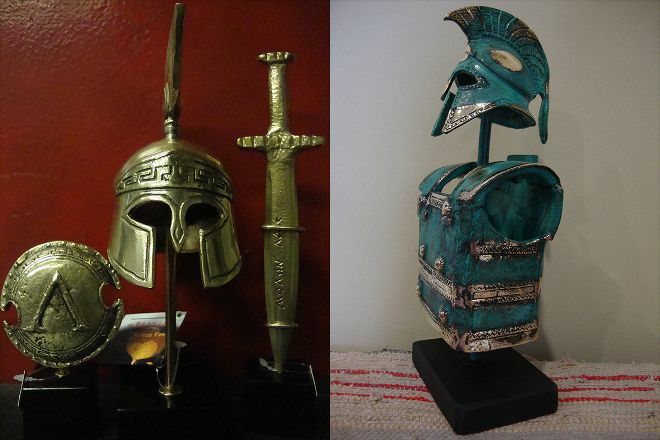 The shop's decorative items--small figures of animals, shields, helmets, bracelets, and others--can make an outstanding gift for someone you love. They also work well as mementos of your trip, and will look great on your mantelpiece or bookshelf. To visit The Bronze - Kelesis Yannis on your trip to Hersonissos, use our Hersonissos road trip tool . We came in this workshop in search of memories made hands and especially authentic. We stumbled upon a father and son are extremely nice, after a visit and explanations of the manufacture of these sculptures, we did the lot of memories. A visit not to be missed! The Foundry is located on top of a hill, together with other workshops, so the place is easy to find. Even though we came late in the day was Yannis very hospitable and showed us the workshop. He told about the casting process and about the originals, he used as models. Smile and a great deal of kindness! He is a good craftsman and shop has reasonable priced goods. I bought some right away. He will make personal gifts if asked. Glad I made a little detour. We had a great afternoon here with kids, Yannis is a patient and good teacher who made lots of time for us. Highly recommended and his art and prices are great too. I visited this unique place with my family in August 2017. and found wonderful people, keen on their profession. My children (6 and 12 years old) were delighted to independently make souvenirs for themselves by ancient technology under the guidance of a great master and a man of a broad soul. Master Yannis and his assistant Gavrilis are very friendly and open-minded people who generously donate their knowledge. The tour will be very informative, especially for children of school age, reserve at least two hours. Guaranteed positive emotions, as well as the opportunity to purchase highly artistic handmade souvenirs in memory of Crete. Mr. Yannis, thank you and your team for your work. We where on the search for ceramics and passed through this place. Beautiful and handcrafted bronze items. Very friendly and hospitable artists. We would recommend to visit this workplace and gallery for sure! Absolutely Genious Artist! Cretan hospitality and reasonable prices! Every day, we help thousands of travelers plan great vacations. Here are some tips on how to use your Listing Page to attract more travelers to your business - The Bronze - Kelesis Yannis. Promote your permanent link - https://www.inspirock.com/greece/anopolis/the-bronze-kelesis-yannis-a7276401665 - on your website, your blog, and social media. When a traveler builds a plan from this page, the itinerary automatically includes The Bronze - Kelesis Yannis. This is a great way for travelers looking for a great vacation in your city or country to also experience The Bronze - Kelesis Yannis. Promoting your link also lets your audience know that you are featured on a rapidly growing travel site. In addition, the more this page is used, the more we will promote The Bronze - Kelesis Yannis to other Inspirock users. For best results, use the customized Trip Planning Widget for The Bronze - Kelesis Yannis on your website. It has all the advantages mentioned above, plus users to your site can conveniently access it directly on your site. Visitors to your site will appreciate you offering them help with planning their vacation. Setting this up takes just a few minutes - Click here for instructions.